Haunted Opera Video Slot Guide & Review - Casino Answers! Haunted Opera is a 5-reel, 20-line video slot developed by Realtime Gaming, featuring a wild symbol, scatter wins, multipliers, a free spins feature and a progressive jackpot. You can play the Haunted Opera Real-Series Video Slot at Bovada. Bets on the Haunted Opera slot machine are $0.01, $0.02, $0.03, $0.04, $0.05, $0.06, $0.07, $0.08, $0.09, $0.10, $0.25, $0.50, $1, $2.50 and $5 per line. You can bet anywhere from a penny per spin on the Haunted Opera slot game up to the highest total bet of $100 per spin. Haunted Opera has a large betting range, so it can be played by both low stakes players as well as high stakes players. To play the Haunted Opera video slot, press the “Spin” button. Haunted Opera’s wild symbol is the Phantom’s Mask symbol. It will substitute for all other symbols except for the Scattered Letter symbol. The Mask symbol will act as a 2X multiplier when one or more Mask symbols appear in a winning combination. When it substitutes in a winning combination during the free spins feature, it will act as a 6X multiplier. The scatter symbol on Haunted Opera is the Letter symbol. 2, 3, 4 or 5 Scattered Letter symbols will pay out 1X, 3X, 10X or 100X your total bet. Scatter wins are multiplied by the total bet. The highest paying symbol on the Haunted Opera video slot is the Sheet Music symbol. 5 of a Kind of this symbol on a selected payline will pay out the 5000 coin top jackpot. When a Mask symbol completes a winning combination with 4 Sheet Music symbols, your win will be doubled to 10,000 coins. The Singer symbol is the second highest paying symbol – worth up to 1000 coins (2000 coins with a Mask symbol). When the Scattered Letter symbol appears on reel 1 at the same time as the Mask appears on reel 5, you will win 5 free spins with a 3X multiplier, so all prizes during the free spins feature are tripled. During the free spins feature, a Phantom may appear on each reel awarding up to 3 additional free spins. Free spins are played at the lines and bet of the triggering spin. The free spins feature cannot be re-triggered. Haunted Opera has a progressive jackpot, which is currently at a tremendous $39,185. The progressive jackpot is won at random, meaning it can be won on any spin you make on the Haunted Opera video slot. You can win the Haunted Opera Progressive Jackpot when you play Haunted Opera at Bovada. Wins on different paylines are combined. Scatter wins are added to payline wins. Payline wins are multiplied by the bet per line. Only the highest win is paid per line. Maximum win per paid spin is 50,000X bet per line. Hit the “Autoplay” button to open the autoplay settings. You will be able to set the number of spins, set it to stop when the jackpot is won, stop if a win exceeds or equals (any amount you input), stop on any win, stop if your balance increases/decreases by any amount you input and stop once the feature is triggered. You can stop the Haunted Opera autoplay mode using the “Stop Auto” button to deactivate it. Turbo Play can be found in the autoplay settings. If you saw and enjoyed the Phantom of the Opera musical, we think you’ll enjoy playing the Haunted Opera video slot. Besides the theme, the biggest plus to Haunted Opera is its nearly $40,000 progressive jackpot, which can be won at any time. To play Haunted Opera, sign up and make your deposit today at Bovada! Can players from the USA play the Haunted Opera video slot? Yes, American players are welcome to play the Haunted Opera slot game at Bovada. For more online casinos that host Haunted Opera, you can read our RTG casinos list. 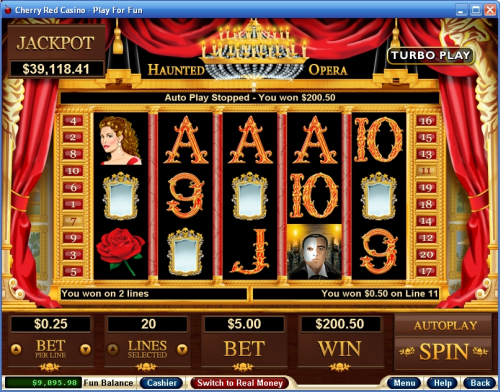 Is there a Flash game of the Haunted Opera online slot that I can play for free? Unfortunately, there is no Flash game available of the Haunted Opera video slot. For a great selection of Flash slot games you can play, please check out our Flash games section. What haunted slot machines are there? Where can I play a slot machine based on phantom of the opera?